Bilişim Hukuku Günlüğü: Happy Birthday Franz Kafka! 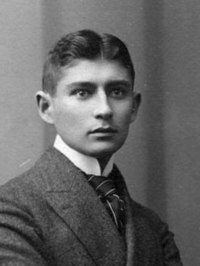 Franz Kafka[a] (3 July 1883 – 3 June 1924) was a German-language writer of novels and short stories, regarded by critics as one of the most influential authors of the 20th century. Kafka strongly influenced genres such as existentialism. His works, such as "Die Verwandlung" ("The Metamorphosis"), Der Process (The Trial), and Das Schloss (The Castle), are filled with the themes and archetypes of alienation, physical and psychological brutality, parent–child conflict, characters on a terrifying quest, labyrinths of bureaucracy, and mystical transformations. Kafka was born into a middle-class, German-speaking Jewish family in Prague, then part of the Austro-Hungarian Empire. He trained as a lawyer and, after completing his legal education, obtained employment with an insurance company. He began to write short stories in his spare time. For the rest of his life, he complained about the little time he had to devote to what he came to regard as his calling. He regretted having to devote so much attention to his Brotberuf ("day job", literally "bread job"). Kafka preferred to communicate by letter; he wrote hundreds of letters to family and close female friends, including his father, his fiancée Felice Bauer, and his youngest sister Ottla. He had a complicated and troubled relationship with his father that had a major effect on his writing. He also suffered conflict over being Jewish, feeling that it had little to do with him, although critics argue that it influenced his writing. Only a few of Kafka's works were published during his lifetime: the story collections Betrachtung (Contemplation) and Ein Landarzt (A Country Doctor), and individual stories (such as "Die Verwandlung") in literary magazines. He prepared the story collection Ein Hungerkünstler (A Hunger Artist) for print, but it was not published until after his death. Kafka's unfinished works, including his novels Der Process, Das Schloss and Amerika (also known as Der Verschollene, The Man Who Disappeared), were published posthumously, mostly by his friend Max Brod, who ignored Kafka's wish to have the manuscripts destroyed. Albert Camus and Jean-Paul Sartre are among the writers influenced by Kafka's work; the term Kafkaesque has entered the English language to describe surreal situations like those in his writing.